Out the door this morning with hand clippers and the pruning saw. I’ve been studying books about pruning fruit trees. I should have pruned my sweet cherry tree years ago–it had gotten tall and leggy. Fruit should be easy to pick, which means the tree doesn’t need to be extremely tall. The tree was here when I bought the house, so I don’t know if it’s a semi-dwarf or full-size. So I pruned it. 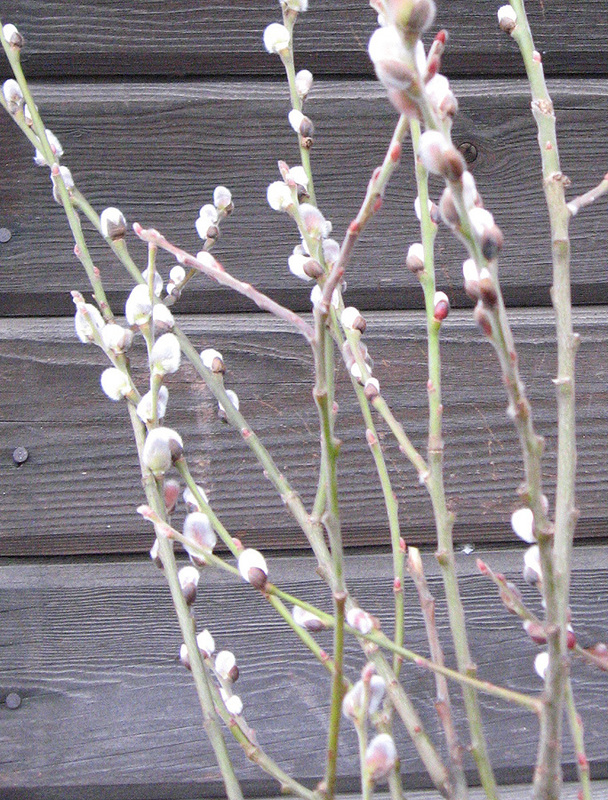 When there have been enough warm days, the buds will open into white blossoms covering the ragged branches I left. The pear tree is in better shape, having been pruned before. I cut last year’s fruiting canes out of the blackberries, then reduced the cherry limbs to small pieces. I saved some of the long straight ones, since a gardener can always find uses for sticks. The last project was the willow tree. It’s a venerable specimen, and fast-growing. It must have started life as a small ornamental bush. The catkins are pink. But it is no longer a bush, and has sprawling limbs tipped in pussywillows. Some of the limbs are dead. Where I have pruned before, there are long sprouts–the bush is renewing itself. I went around looking at all the buds: the golden currant has tiny reddish leaves already; bridal wreath spirea has little green nubs, the lilac has pairs of knobs, honeysuckle buds are purplish, as are the daphne’s, and most of the roses have just flecks of buds along their thorny twigs. No sign of life yet on the grape vine or clematis or syringa.